Blood is a hidden gem, rife with dark humour and horror cliches whilst offering challenging game-play and excellent level design. 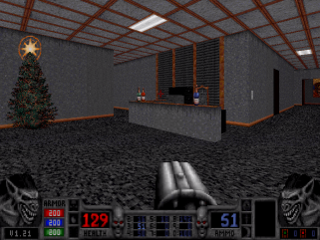 Despite its glitches and design errors, such as the super-accurate human enemies and their poor TNT-tossing abilities that commonly blow up their allies and themselves, Blood is still an excellent retro first-person shooter. A handful of months after the game’s release, Monolith Studios released the Plasma Pak expansion pack. Despite being a collection of leftover maps and bonus sprite-swapped enemies, it’s a pretty good add-on nonetheless, and a welcome addition fo any Blood fans out there. Not much of a story is present, meaning levels aren’t confined to a specific area (like the second episode offered many frosty areas in cold climates). After Caleb defeated the dark god Tchernobog, the Cabal decide to recruit four new Chosen. In the start of the game, Caleb and his chums took these roles, and were very high in the evil cult’s roster. So, the sadist sets off to put the Chosen down, wasting anyone in his path. The new chapter is called ‘Post Mortem’, and features eight levels with one secret level thrown into the mix. 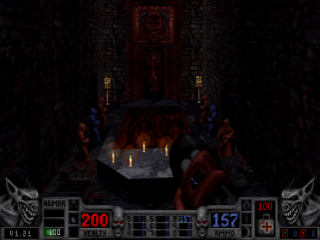 The two urban levels located in a market and shopping plaza are great fun, and so was the large and expansive warehouse, but levels like The Ruined Temple and Forbidden Rituals, taking place in stone fortresses, are considerably more simplistic in design and do not utilize the power of the game’s engine to much extent. The aqueduct facility is the weakest entry of the expansion, for it has a lot of water that enemies can swim around at top-speed and spam the player relentlessly with lead. Of course, this does not mean the weaker entries are bad. They certainly pack one hell of a resistance, and are fun because of this. For instance, The Dungeon offers three passages behind a set of locked doors, where three buttons will open up the paths to explore, hosting three super-tough Stone Gargoyles to battle and plenty of zombies alongside. Whereas, the secret level, known as the Forgotten Catacombs, is a no-frills series of yellow-brick tunnels which feel a bit bland to fight in. As for the final battle, humourously titled Beauty and the Beast, whilst challenging and somewhat satisfying, it’s too compact and short. Killing just one of the four Chosen (depending on the difficulty) will open up the level exit, and upon hitting the switch, cue the credits! No cut-scene, no dialogue, just an abrupt end to the carnage. Not to mention the overuse of two particular music tracks which have been assigned to most of the missions.What a bloody mess. Alongside this, there are three bonus multiplayer maps of decent quality, although, like most of the campaign levels, they lack much interactivity. One of them is quite maze-like, however, because it takes place in Monolith Studio’s offices! There’s plenty of firepower to loot, as well as an interesting visitor to battle in one of the rooms. Warp to this level on the hardest difficulty solo and see if you can put down the nasty visitor, it’s none too easy! There are new enemies, too. The green-robed Acolytes are grenadiers and will endlessly throw TNT bundles, they certainly add more bang to any Cultist’s buck. The blue dudes are Zealots, high-ranking elite troops that pack Tesla Cannons and are resilient to your electrical attacks. Whilst they’re a worthy challenge to battle, they become a real nuisance underwater (zapping the water won’t electrocute everyone, because screw logic). Chrysalis pod plants will spit acid or lava and send roots to slap folk around, whilst mini-versions of Caleb will burst out of windows and blast away whilst regurgitating one-liners with their humorously squeaky voices. The new boss starts off as an orange-robed Priest armed with an auto-shotgun, who transforms (after taking a bit of damage) into a Beast , a seven-foot tall werewolf. Fast, resilient and strong, they’re some tough pups. Their stomp move is very powerful; armour and even jumping off of the ground will not stop it causing damage, which is just unfair. Since the level that feature these freaks is called Beauty and the Beast, why couldn’t have Gaston helped hunt ’em down? No new guns appear, but the Tesla Cannons can be dual-wielded, Napalm Launchers can spew out bouncing balls of lava, and the Life Leech can be placed on the spot to attack baddies like a sentry. All of these are nice additions, despite being over-powered in multiplayer. The Plasma Pak comes with some patches that fix some problems, but certainly not all of the glitches and bugs in the system. Damn. The Plasma Pak is a bloody good transfusion of new maps and content, despite the numerous unfixed bugs, not to mention the map quality that is not as pretty or as interactive as those from the main game. Offering new, challenging maps with more locations and monsters to kill and even more ways to paint the walls red, the Plasma Pak is good, but could have been much more.